Six years before director Alex Proyas would hit the mainstream with The Crow, and four years after that with Dark City, he cut his feature-length teeth on the DIY Australian production Spirits of the Air, Gremlins of the Clouds, a film that scarcely made it out of its home country, having never been officially released in the U.S. either theatrically or on home video. The story of Spirits takes place in a post-apocalyptic world, where all modes of transportation are either defunct or forgotten. In this world, Felix (Michael Lake) and his eccentric sister Betty (Rhys Davis) live a solitary life in the desert. One day they find an enigmatic figure named Smith (Norman Boyd) on their doorstep. Seemingly on the run, specifically from three mysterious cloaked figures, Felix insists that Smith stay with them. However, it’s against Betty’s wishes as she believes Smith to be a demon, and is intent on getting rid of him one way or another. Felix begins sharing with Smith his plans for a flying machine, which he believes one day will carry him and his sister out of the desert and away from their isolated existence. Smith reluctantly agrees to help build this machine, but time is running out as Smith’s captors are hot on his trail. Spirits is a Gilliam-esque piece that immediately reminds one of films like Brazil and Time Bandits. Along with the many music videos and TV commercials that Alex Proyas did in the 1980s, the film was basically his calling card for bigger things. However, Spirits is an attention-grabber all on its own. Besides the extraordinary visuals, there’s also the three characters, all of whom are totally absorbing, particularly Betty who would rather sit in a chair in a barren wasteland and play a large, standing, bass-type instrument than deal with change. Felix we’re never quite sure about, and the relationship between he and his sister lets us know right away that one or both of these characters may be off their rocker, and that Smith may be in danger. On the other hand, we’re also not entirely sure about Smith’s intentions. He seems to do what he wants with total disregard for anyone else. It’s basically a world in which anybody can be pushed over the edge at any time, if given the proper leverage. Spirits of the Air, Gremlins of the Clouds, ultimately, is an art piece rather than a narrative one – more thematic than story-driven. With nothing more than sand and sky in his palette, Proyas paints a thematic picture of longing and loss, both almost exclusively intertwined with each other. In a dead world where all hope is lost, glimmers of it might still be found, all within the confines of the earthen floor and the open blue. 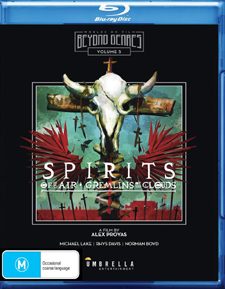 Umbrella Entertainment’s Worlds on Film: Beyond Genres line of Region Free Blu-ray titles continues with Spirits of the Air, Gremlins of the Clouds, which is Vol. 5 in the line. It’s presented via a gorgeous new 16mm transfer in 2K quality. As explained in the director’s commentary, almost all instances of blue on the set were removed to further enhance the skyline, meaning that it’s one of the dominate color schemes, aided by the reds and browns the deserted landscape. Grain levels are thick with high levels of detail in both close-ups and wide shots, particularly the vast landscapes with figures sometimes far off in the distance to the left or right of frame with other objects directly in the foreground. Skin tones appear appropriately warm while black levels are deep with good contrast. It’s also a stable presentation with only the mildest of speckling leftover. As I’ve never seen the film before and have absolutely nothing to compare it to, it’s difficult to base my opinion of the transfer on anything that came before it, since nothing did. However, taken on its own, it’s a stunningly crisp presentation. 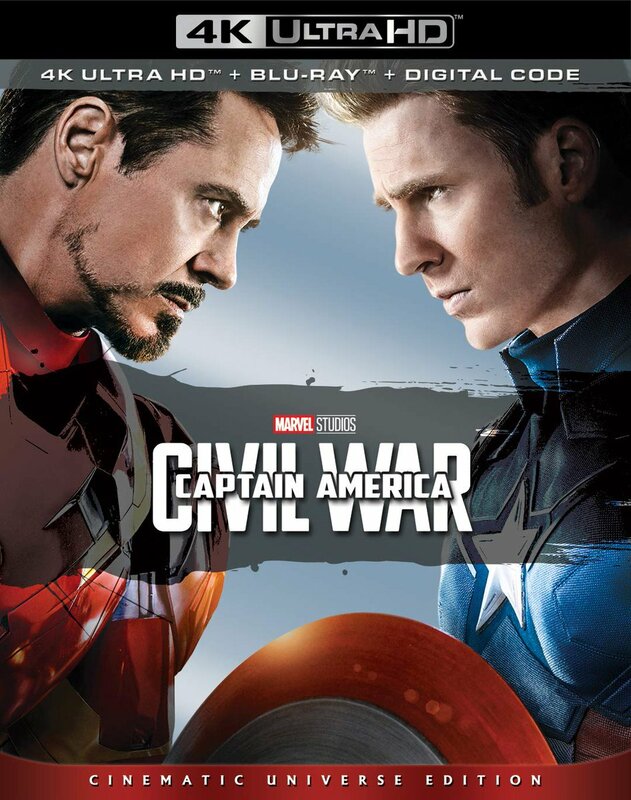 The audio is presented on two tracks: English 5.1 and 2.0 DTS-HD, with optional subtitles in English HoH (pressing Play Feature on your remote control will reveal these options). While the 2.0 track is fairly narrow, the 5.1 adds much more shade and substance, particularly when it comes to score and sound effects. Everything sounds much fuller. Dialogue is clear when discernable and there’s no major leftover damage to speak of. This release also contains a substantial amount of extras, including an audio commentary by Alex Proyas; another audio commentary by composer Peter Miller and editor Craig Wood; an 8-minute interview with actress Rhys Davis; a 37-minute interview with actor Michael Lake; Spirits: Making a Post-Apocalypse Western, which is 24 minutes of various pieces of behind-the-scenes footage; the Spirits Song music video by Peter Miller and Karina Hayes; an image gallery with 111 stills of behind the scenes photos, sketches, promotional and print materials, and home video artwork; the film’s 2018 re-release trailer; an Easter egg that can be accessed after clicking left when Alex Proyas’ commentary is selected, which will reveal an eye that takes you to an unrestored version of the film’s opening sequence; and another Easter egg that can be accessed after clicking left when the interview with Michael Lake is selected, which will also reveal an eye that takes you to Alex Proyas’ MTV short entitled In Your Eye. While I have the feeling that Spirits of the Air, Gremlins of the Clouds is not going to be celebrated for finally being available, and in such a dynamite package, I urge fans of Proyas’ work to check it out. It’s a beautiful film that is begging to be rediscovered. Between the new 2K transfer and extras, this is an excellent release that’s worth a cineaste’s consumption time.